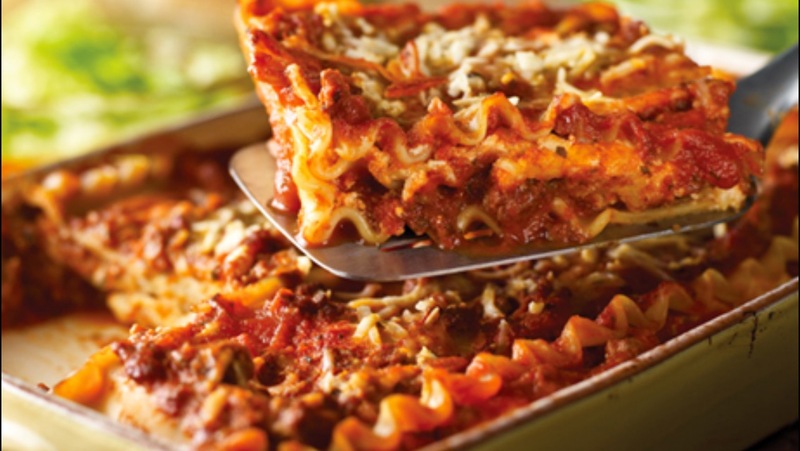 It’s all about the layering when you make lasagna and is so easy when you start with a sauce already made and delicious. 1-Stir the ricotta cheese, mozzarella cheese, 1/2 cup Parmesan cheese and eggs in a medium bowl and set it aside. 2-In a 3-quart saucepan over medium-high heat, cook the beef until it’s well browned, stirring often to break up the meat. Pour off any fat. Stir the sauce in the saucepan. 3-Spoon 1 cup meat mixture in each of two 2-quart shallow baking dishes. Top each with 2 lasagna noodles and about 1 1/4 cups cheese mixture. Repeat the layers. Top with the remaining 2 lasagna noodles, remaining meat mixture and the Parmesan cheese. 4-Bake at 400°F. for 30 minutes or it’s until hot and bubbling. Let stand for 10 minutes.